Whether you’ve written any fiction yet or not, you’re probably extremely familiar with how dialogue appears on the page: it’s surrounded by quotation marks. Even if you’re not quite confident with all the finer details of formatting spoken words on the page, it’s probably perfectly natural to you to wrap these words in quotation marks. You likely don’t think twice about it, although this isn’t actually the only option you have. “Yes, though it’s the all stopper,” Daniel said. John: Excuse me. Is this the train for London? Daniel: Yes, though it’s the all-stopper. – Excuse me, John said, is this the train for London? – Yes, though it’s the all stopper, Daniel said. Chances are, you’re using type #1, and that’s all well and good. But what do you do when you want to represent an exchange of words that isn’t quite so conventional as a face-to-face chat? Maybe your characters aren’t conversing face-to-face, but through a text message conversation. How do you represent written dialogue instead of spoken dialogue? If you’re writing something with an SF/F slant and you have two (or more) characters communicating psychically, how do you set that out on the page? Well, there’s no established convention. Different authors do different things (though you’ll find there’s a fair amount of overlap). In this post, I’ll take you through some possibilities … but the key thing to remember is however you choose to represent your unorthodox types of dialogue, be consistent. I’ll tackle these first as (a) they’re common to all sorts of types of fiction and (b) they’re not very different from face to face speech. She pressed the buzzer. There was no response after a minute so she pressed again, holding the buzzer down until the intercom crackled. “Yes,” a voice said, indolent, as if he had been woken from sleep. It’s set out just like normal speech, and that’s what I’d recommend: there’s no need to do anything fancy. A call might get cut off, or be inaudible to one person. As with normal dialogue, I’d recommend representing cut-off speech with a dash (–), and someone trailing off with an ellipsis (…). You can’t so easily use body language to provide a dialogue beat, as the speakers can’t see one another. You may want to include thoughts, or have verbal indications of how the non-viewpoint speaker is feeling (e.g. a pause, a cough, changing the tone, speed or volume of their speech). For me, this is where using quotation marks isn’t necessarily the default choice – though it can be a perfectly sensible one, especially if you only have a handful of text conversations in the course of your novel or story. “How’s the job hunt going?” Seth asked, in Messenger. Mark checked his inbox again, out of habit rather than expecting anything. But there it was, a reply from the job he’d just about met the requirements for. A glance told him all he needed to know. Unusually high number of applications … Thank you for your interest. Kevin Handsome was g-chatting. By “lunch” he meant heading down to the cafeteria at the same time to buy our lunches, and then riding the elevator back upstairs together to eat separately at our respective desks. In all it was a ten-minute date, five minutes tops of uninterrupted conversation. A minimum of three minutes of palm sweats and me obsessing. What does this guy want from me? […]I agreed to lunch. It’s build-your-own-burger day, I replied, to emphasize that I was in it solely for the red meat and unlimited fixings, not Kevin’s company. See you down there. Jackdaw44: Do you want to play a game? Jackdaw44: Questions. I’m bored. It’s just a bit of fun. Jackdaw44: I take it that’s a yes. OK. First question. Would you rather go deaf or blind? ICE9: You really are bored, aren’t you? Deaf. How Grammatical Should Your Text Dialogue Be? It’s a fairly well established convention that with regular dialogue, you’re not seeking to transcribe how people actually talk – you’re giving a stylised representation of real-life speech. When it comes to text conversations, though, it’s trickier: you might feel that you should keep these realistic – you’re essentially transcribing what your characters would type. Unless it’s really important for your characterisation (or possibly your plot), I’d suggest using standard spelling and grammar. With smartphones and predictive text, “txt spk” is rapidly dating, plus it can be distracting and annoying to read. It really is me, although I can’t think of a good way of proving it to you. How about this: nothing happened to me in a toilet in Minneapolis. Or this: I don’t have a secret love-child with Julie Beatty. Or this: I stopped recording altogether after I made the album Juliet, so I don’t have two hundred albums’ worth of material locked away in a shed, and nor do I regularly release material under an assumed name. For longer emails and forum posts, I tend to set them apart from the narrative with an extra line break. For very short (one-line) messages, I put them in italics and include them in the normal flow of the narrative. You may well treat text messages (between people’s phones) in a similar way to emails, or in a similar way to real-time text conversations. Think about how much back-and-forth will occur, and what’s going to work most seamlessly for that. If you’re writing fantasy or sci-fi, you might well run into situations where characters will talk to one another through psychic means – whether due to magic, technology, or a bit of both. Is this what the night is? she wondered. Truly? He laughed, softly. You can’t. Child of the sunlight! Heir to life and all that it implies. There’s beauty in that world too, although of a cruder sort. Are you really ready to give all that up? To give up the light? Forever? The darkness withdrew into two obsidian pinpoints, surrounded by fields of cracked ice. His eyes. The dark fae was alive in there, too, and a music that was far more ominous – and darkly seductive. She nearly cried out, for wanting it. Ultimately, as with so many writing decisions … it’s up to you! Ideally, with any form of non-standard dialogue, you want to opt for whatever styling will be as straightforward and unfussy as possible … while keeping things clear. Do you use any unconventional types of speech in your fiction? Have you read a novel that successfully – or unsuccessfully! – uses text, email or psychic communication? Drop a comment below to let me know about it. 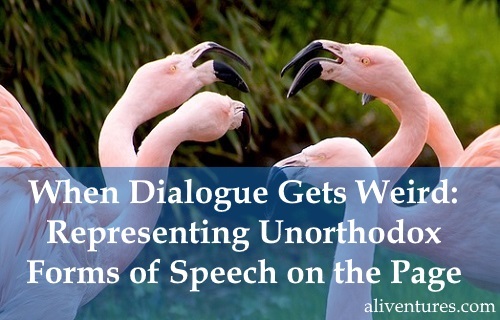 This post goes through three different examples of dialogue-that-works – all very different. I also go through six key ways to make your dialogue stronger, and cover some key pitfalls to watch out for. In this post, I explain why you can probably use “said” more often than you think – and offer ways to change things up with different tags, and with the use of dialogue beats. I also explain some of the finer details of formatting these, particularly in terms of punctuation and capitalisation.